The staff were very helpful, especially Mr. Cici Liu at the reception. Clean and comfortable. The hotel was located near the metro and some western fast-food restaurants open until late. There is a good self-service for laundry and ironing clothes. South Qilianshan Road Station is not so big but there is a small shopping center. Hotel is directly connected to the station so it takes only couple of minutes on foot. The room was very spacious and comfortable for 3 people. The bed was super comfy and the room was very clean. The staff was very welcoming and spoke English, which was also great. The location was also perfect as it was connected to the metro and also had a Papa Johns and Starbucks too! A standard business hotel located right above the metro so the connectivity is great. Lots of little unexpected extras like the free tea, coffee, fruit and biscuits in reception every day were a lovely touch. Room was way more luxurious that we expected and was probably the best value for money stay that we have ever had - absolutely brilliant. The breakfast is value for the expenses; and the service of the staff is good. Very helpful and polite staff. Self-service for laundry. Metro station at the same place. Very clean and comfortable. Little GYM with drinking-water. Bed's are great. 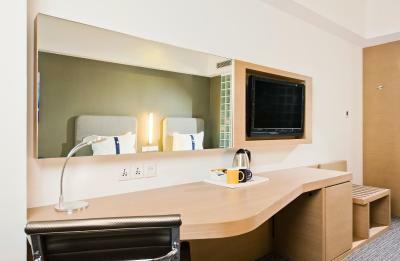 Conveniently close to South Qilianshan Road Subway Station (line 13), Holiday Inn Express Shanghai Jinsha is located at Jinshajiang Road, Putuo District, 3.7 mi from Hongqiao Airport. 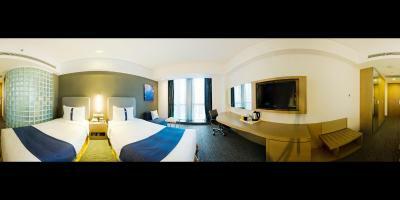 It offers 3 meeting rooms, 2 dining options and accommodations with free internet access. Holiday Inn Express Shanghai Jinsha is a 15-minute drive from Changfeng International Ocean Park and 16-minute drive from Shanghai Zoo. Pudong International Airport is an 1.5-hour-drive away. Global Harbor Shopping Mall can be reached by metro in 3 stops. The property is connected with Met Shopping Mall which can fulfill your entertainment requirement. 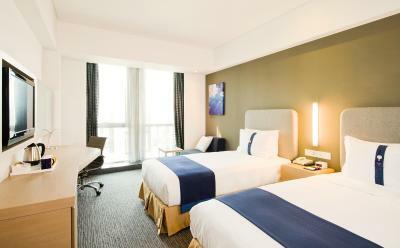 Elegant guestrooms offer modern interiors, and are fitted with high-definition flat-screen TVs and iPod docking stations. 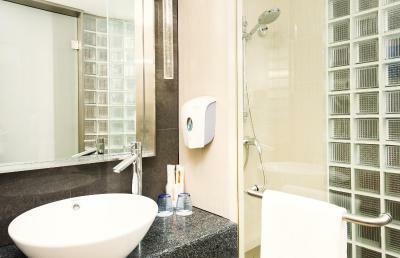 The stylish private bathroom in each unit features a shower and free toiletries. Staff at the business center can assist with fax, photocopying, printing and currency exchange services. 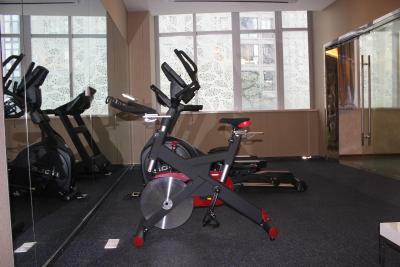 The hotel is equipped with automatic vending machines and other self-service facilities. 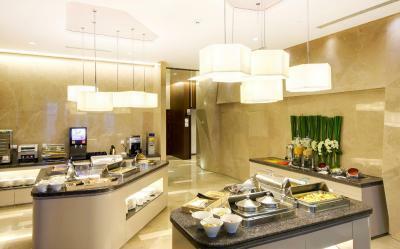 The restaurant at the property serves complimentary daily breakfast buffet featuring Chinese and international dishes. Kids Eat Free program is offered. Alternatively, guests can spend a relaxing afternoon tea and refreshing beverages with friends in the stylish bar. 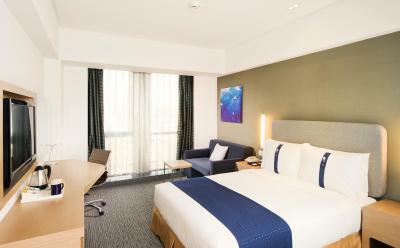 When would you like to stay at Holiday Inn Express Shanghai Jinsha? 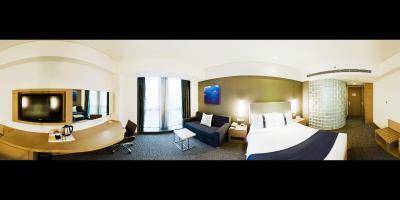 Room comes with a Ipod docking station, 32-inch flat-screen TV, an ergonomic chair and private bathroom with a shower. Rate includes breakfast. This is a wheel-chair accessible room. Includes an iPod docking station, a 32-inch flat-screen TV, an ergonomic chair and private bathroom with a shower. Twin-sharing room comes with a Ipod docking station, 32-inch flat-screen TV, an ergonomic chair and private bathroom with a shower. Rate includes breakfast. A wheel-chair accessible room. Includes a 32-inch flat-screen TV, an ergonomic chair and private bathroom with a shower. This twin/double room features a iPod dock, seating area and air conditioning. This double room has a sofa, seating area and air conditioning. House Rules Holiday Inn Express Shanghai Jinsha takes special requests – add in the next step! Dragon Holiday Inn Express Shanghai Jinsha accepts these cards and reserves the right to temporarily hold an amount prior to arrival. Holiday Inn Express Shanghai Jinsha accepts these cards and reserves the right to temporarily hold an amount prior to arrival. Air-condition machine was not working. They charged me more that was Quoted, I asked them why and the manager said they always do it , but they will refund me. When I booked out the same story. Up to now no refund?????????????? I feel you stole from me. I can not recommend you to other people. Place was clean, personell was friendley. No one speaks English. It was hard to explain. One guy was good. Breakfast isnt continental. For South Asians it will be tough. Wifi is worst. No one will help to carry ypur Lugguage to room. This is a basic courtesy even in 1 star hotel!! You bring it you take it!! Rooms are good and comfortable. I was charged on my CC more than the actual price that I have to pay. On the receipt issued by Holiday Inn it was written RMB 1,354.28 but in my CC it was charged RMB 1,500. Very lame administration! Breakfast was ok and the room is clean. bathroom with no ventilator, small sized guest room, disgusting smell on 2nd Floor and toilets on 2nd and 1st Floor were really disgusting. The facility for Gym and Self-Serviced Laundry was good. The hotel managing team looked after the guests well. Due to the unprofessional cleaner, my daughter was refused to get her bed set changed after she found there was an insect mark on the duvet cover; and I needed to wash the mugs after I had tea/coffee. The cleaner(s) on the 7th Floor always missed one or two small task(s) on daily basis. Luckily, the hotel manager and supervisor of Guest Rooms (Miss Bao-juan Gao) took a proper action after I raised the Cleaning issue to them. Especially thanks for the hotel manager, Miss Gao and Mr Cai (Gao Cai) who quickly sorted out the problem with the electronic iron in Laundry Room for me. Miss Gao also patiently show me how to use the vertical iron. Cleaning is the big issue in this hotel as I experienced two years ago. However, people who chose this 2/3-star hotel (or even just B & B) need to bear in mind that the staff in 2/3-Star hotel would unlikely to provide 5-Star Hotel Service. Breakfast could have been more internationalized. Announcements by staff should also be in English as not all the guests are Chinese.